St Germans is a picturescque village within the Tamar Valley Area of Outstanding Natural Beauty in South East Cornwall, UK. 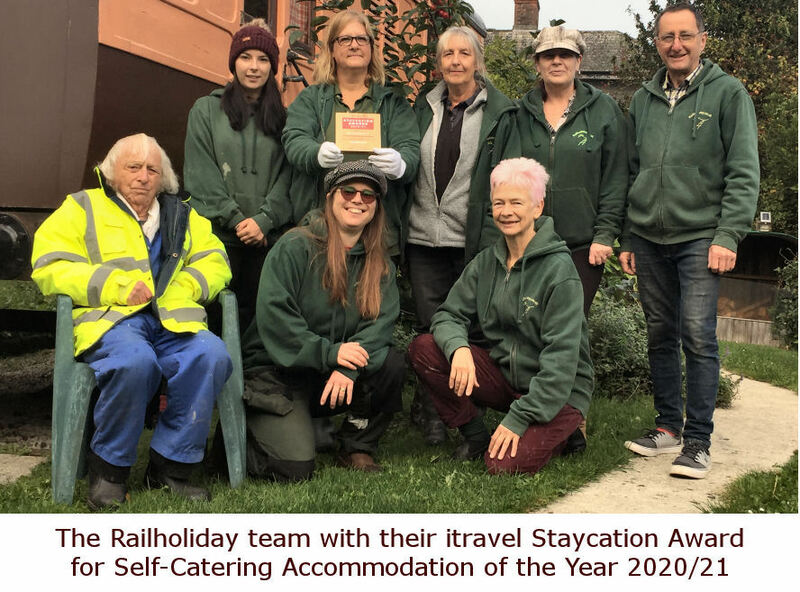 The railway station and Railholiday are within the beautiful St Germans Conservation Area which owes much of it's character to the ancient Port Eliot estate which adjoins it. 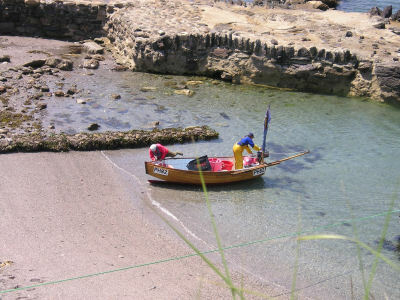 The coast with its beaches, fishing villages, magnificent cliffs and coastal footpath is only a short bus or train ride away. The quay, with the viaduct towering above it is a popular spot for relaxing and bird watching - the Lynher estuary here is designated as a Site of Special Scientific Interest. There is a lovely circular short walk from the railway station down to the quay and along the estuary through woodland, passing under the viaduct. 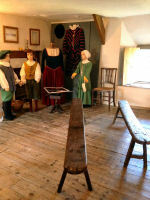 Other village highlights include a row of alms houses built during the reign of Queen Elizabeth I and a terrace of former police houses complete with cells built in the 1850's. 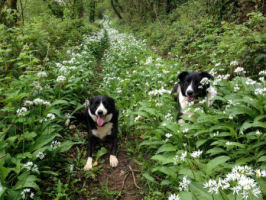 Only a ten minute reasonably level walk from Railholiday is a great village pub, The Eliot Arms, (01503 232733) serving Cornish ales and excellent food. Beside the Eliot Arms is the St Germans Community Shop and Post Office (01503 232887) a general store with an excellent range of stock including food, household supplies, newspapers and magazines, local products, alcohol and tobacco amongst many other things. It is open 7 days a week. Closest to the cariages at only 150m is Scholars Restaurant and Wine Bar. 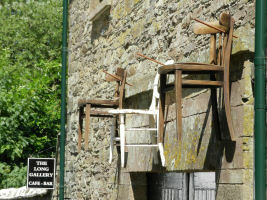 This is located in the former St Germans School buildings dating from the 1800's. There is also an excellent fish and chip van that visits on Mondays between 5 and 7pm. St Germans Railway Station was built in 1858 to a design by Brunel on the Great Western Railway main line from London to Penzance. It is served by 12 stopping trains per day each way including 3 direct London trains. 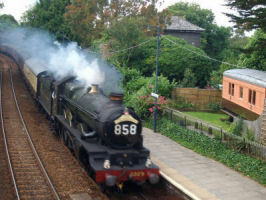 Cornwall was fortunate in retaining most of its branch lines and it is easy to holiday without using the car at all. Please see our Transport Page for more information. 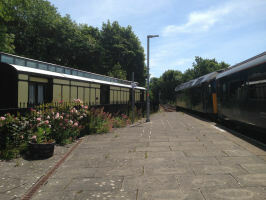 The St Germans Public Transport Users Group produce a Train Timetable for St Germans - or you can "like" them on Facebook for the latest news and up to date information. They also produce a very good "A Walk Round St Germans" leaflet, a copy of which can be found in all Railholiday carriages. 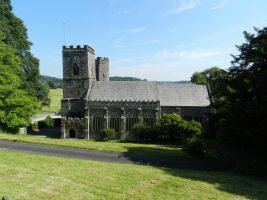 St Germans Priory Church is one of the most important religious buildings in England. Built beside a monastry it has a Norman door, Edward Burne Jones stained glass window and was once the cathedral of Cornwall. The priory is open all day, every day, and used for regular services on Sundays, bellringing on Thursday evenings and concerts throught the year. A new annual event is the Christmas market at the end of November. There is also a thriving methodist chapel. 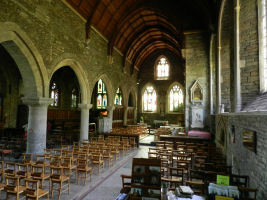 The nearest Catholic church is in Liskeard and we can usually arrange a lift to services should you need one. Port Eliot House and gardens (Open for 3 months in the spring) is believed to be the longest continually inhabited house in England - since the 16th century by the Eliot family. The Grade 1 listed house dates back to the 5th Century and was substantially altered by Sir John Soane at the turn of the 19th Century. The Grade 1 listed gardens were laid out by Humphrey Repton and stretch down to the Lynher estuary. 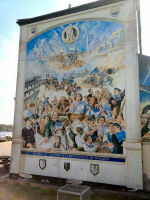 The famous Round Room has a 40ft mural by Robert Lenkiewicz covering the entire wall. There are also masterpieces by Sir Joshua Reynolds, Romney, Ramsey, Van Dyck. 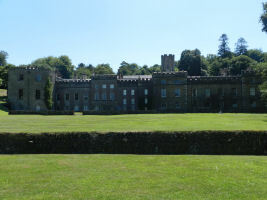 Former venue of the (in)famous Elephant Fayre, Port Eliot now hosts the Port Eliot Festival at the end of July each year. Guests have access to our ten acres of woodland just a few minutes from the carriages (see Colgear Plantation on the map above). Starting with the snowdrops in January and progressing through wild garlic, bluebells, foxgloves to autumn colurs and sweet chestnuts to take back and roast, there is always something to see in the woods - and they border the railway line! A beautiful walk just above the woods is the aptly named Longfield. 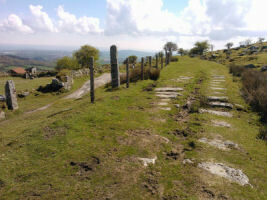 This is an ancient byway that passes through an iron age hill fort. Treasure Trails have a popular and informative trail around the village. 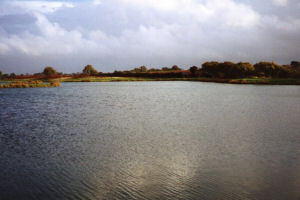 Bake Fishing Lakes (Open all year) are 2 miles away and comprise 5 lakes offering both course and fly fishing in beautiful surroundings. Equipment can be hired and tuition is available. Beginners are welcome. There are numerous National Trust properties, ancient monuments, golf courses and river trips within easy reach. For an evening out, The Halfway House (01503 230202) in the neighbouring village of Polbathic is only half a mile away and also serves delicious home cooked food. 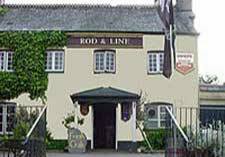 Two miles down the road is the infamous Rod and Line pub (01752 851323) in Tideford, well known for its live music, excellent scallops and crab, and spit and sawdust atmosphere. Our local taxi service Ant's Taxis can be booked for a car free evening (07788 900222). Alternatively, the train times work out well for an evening spent in Liskeard, Saltash or Plymouth where there is a wealth of choice. The journey time is only 5 minutes to Saltash and the fare is around £2. 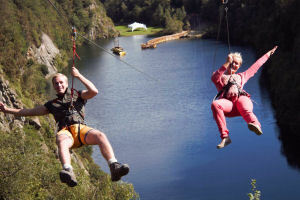 Adrenalin Quarry - For thrill seekers, look no further than the fabulous Adrenalin Quarry! 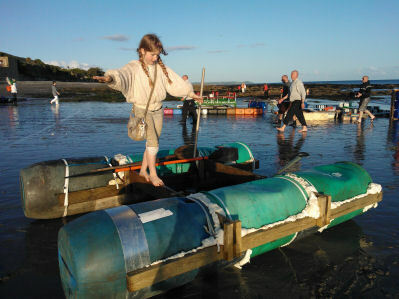 Sitting beside Menheniot station, between St Germans and Liskeard, Adrenalin Quarry boasts Cornwall’s most dramatic zip wire, a giant swing, axw throwing, a kart circuit, coasteering and an amazing aquapark with challenges for the whole family. Those that do not long for thrills can take a picnic on the lawn, or indulge in some wild swimming in the lake for free. In addition to the village shop, there are some excellent local produce shops nearby - including Purely Cornish in Looe, Bray's butcher selling local meat in Tideford, Pengelly's fishmongers selling the best line-caught fish from small local boats in Liskeard and Looe. Both of the later have featured in Rick Stein's food heros. There is a company called Food4myholiday which produce their own home cooked meals, and will deliver provisions to the door. Trerulefoot, less than two miles away, is a tiny hamlet on the main road with a choice of two diners; the generously portioned American themed Route 38 and the Kernow Mill, an Edinburgh Woolen Mill outlet with cafe and extensive Cornish gifts shop. 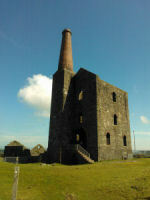 Please visit the Things To Do in Cornwall page and also take a look at St.Germans on our Railholiday Pinterest page. 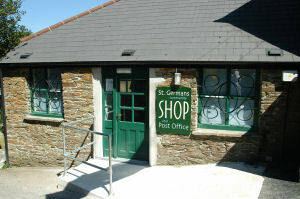 As a touring centre, St Germans is well postitioned, with good rail connections and the A38 only 2 miles away. Close by are the south coast beaches, fishing villages (including Looe and Polperro), Bodmin Moor and Dartmoor, Plymouth city centre (15 minutes by train, crossing Brunel's Royal Albert Bridge) and the preserved railways of the Bodmin and Wenford, Plym Valley and the South Devon. The beautiful, Network Rail owned, Tamar Valley and Looe Valley Lines are only minutes away. PT indicates easy by public transport. Saltash is a very old town which came to prominence because the relative narrowness of the Tamar river at this point made it a crossing point. Consequently much trade passed through the town. By public transport it is one stop, or six minutes, by train, making it convenient for taking advantage of its many fine pubs or for a quick shopping trip. From the station follow the forecourt to the Two Bridges, a real character pub. Heading upwards to Fore Street you pass the historic St Nicholas and St Faith church and Elliotts Store, a time capsule of days before the giant supermarket boom that is largely unchanged since the 1940’s. You can access the Tamar bridge from this area, which is a good place to admire the mighty Brunel Rail Bridge. Head up the hill and you come to Saltash’s shopping centre and beyond that at the top of the hill the leisure centre and swimming pool. Alternatively we would recommend a walk to the pretty Waterside and a drink at the characterful Union Inn with its live music. 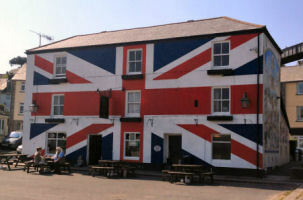 This is a traditional pub in all senses; no food, but real ales (try "one from the barrel"! 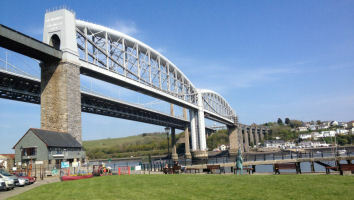 ), a friendly welcome and fabulous views of the Brunel Bridge. If you have young children there is a lovely railway themed playpark. 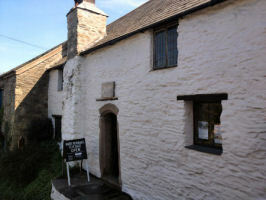 From here you can easily visit Mary Newmans Cottage where the future wife of Sir Francis Drake was born. Another place to explore on a fine day is Churchtown Farm Nature Reserve at St Stephens in Saltash. 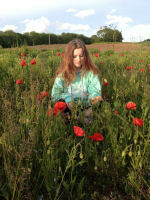 This is managed by Cornwall Wildlife Trust and is especially good in summer for butterflies and wild flowers. 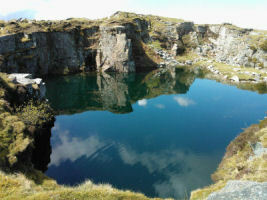 Make sure you visit Adrenalin Quarry on the way to Liskeard. A must for thrill seekers of all ages! The town owes its past prosperity to the local mining industry and this is reflected in the grandier of the buildings. It is also a market town and still retains the cattle market at its center. The major banks are represented here as are some highstreet names and also some shops of character. Visit on a Thursday or Saturday morning to make the most of the quirky bric a brac stalls in the old market car park. As well as the Liskerrett centre, we can recommend Olives as a most excellent cafe. Liskeard Museum - lovely museum specialising in mining history, minerals and photography. Liskerrett Centre - Arts and community centre, with an excellent vegetarian cafe opening on weekdays. Carnglaze Slate Caverns - underground slate mine with enormous caverns and underground lake. Downderry and Seaton - These fishing villages only four miles from St Germans are great for dog owners and worth heading to for a walk, rock pooling or something to eat. At Seaton there is a country park with children's play area, outside gym, cafe and pub, while Downderry has an excellent restaurant, the Blue Plate, The Inn on the Shore pub and a spar shop. Watch out for carnival week at the end of July with its raft race that takes to the high seas and the lantern procession before Christmas. To get there by public transport - catch the bus towards Looe to Hessenford and take a scenic and flat footpath walk along the Seaton river. There's a very good pub at Hessenford too - the Copley Arms. Whitsand Bay - 5 miles of high cliffs and the best beaches on Cornwalls south coast stretching west from Rame Head. It is well worth descending the network of paths to seek out the quiet coves and broad beaches, with their white sand below. Good for surfing, the tide comes in quickly and rip tides are common, so for swimming it is worth going to either Tregantle or Freathy where lifeguards are in attendance during peak months. There is the Adventure Bay Surf School at Tregonhawke and the Whitsand Bay Cliff Cafe is recommended for cakes and lunches.The only toilets on the beach are at Tregonhawke. All beaches are dog friendly. 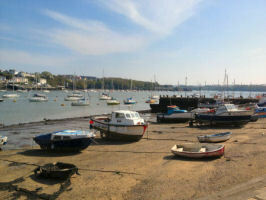 Kingsand & Cawsand - twin coastal villages where cottages cluster around a small quay. 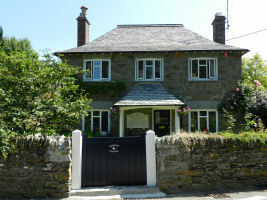 It is a pleasant 2 mile walk from Cawsand, west along the coast path to Rame Head. On the way, just as the path emerges from the trees and set into the cliffs are the remains of a small church. From here are visible Trinity House buildings that contain a fog horn. From Rame Head it is possible to return to Cawsand by the lanes, passing Rame Parish Church on the way. There are two very good cafes in these villages; Morans, The Old Bakery (01752 656215) selling home baked bread and cakes, and Maker Canteen, at the top of the hill. By public transport - Catch the train to Plymouth, then walk to the Prince William yard and catch a ferry to Cawsands. Rame Head - a distinctive rocky promontory surmounted by the shell of an old chapel. The chapel was first licensed for mass in 1397 and was dedicated to Saint Michael. It is probably on the site of a Celtic chapel. The hermit priest who occupied the building lived in its upper floor and was responsible for lighting a beacon to guide mariners and also warn of seaborn threats. As early as 1486 records exist of Plymouth paying a watchman at Rame to maintain a beacon there to warn shipping and to bring news to Plymouth of important ships. A concrete structure standing on the seaward side of the building is the remains of a second world war radar station. 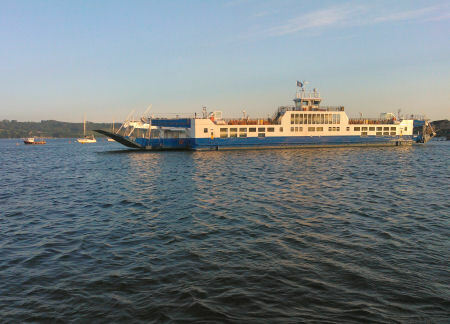 By public transport - catch the Cawsand ferry as above and walk from Cawsands. Wacker Quay - A fantastic place to birdwatch, many waders and estuarine birds reside in the waters here. There's also the remains of an engine shed and line once used for supplying the fort at Antony. Torpoint - Until the opening of the road bridge in 1961, the car-ferry linking Torpoint with Devonport and Plymouth was one of the main gateways to Cornwall. Torpoint is fiercely Cornish enough to host some good local shops, including an excellent fishmonger, banks, takeaways, pubs and a small Sainsbury’s supermarket. While Torpoint is not particularly worth a visit in itself, it is a pleasant day combined with Antony House and catching the ferry makes a scenic alternative route into Plymouth. By public transport catch the train to Plymouth, then walk or take a Torpoint bus to the ferry (buses go from Royal Parade). Just outside Torpoint is the National Trust owned Antony House, Tel: 01752 812191. Anthony is surrounded by thickly wooded gardens and lawns sloping down to the Lyhner estuary. The Carew family have lived on the estate since the 15th century and the present house, built in 1721, is in the Classical style with a central block of Pentewan stone joined by colonnades to red brick wings. The house, used as the backdrop for the 2010 blockbuster Alice in Wonderland, contains exquisite tapestries, a large library and dining room and some fine pieces of 18th century furniture. 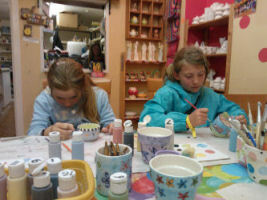 Open on certain days Apr-Oct, check website for full opening times. The nearby village church of Antony has a full length brass of Lady Margery Arundell dating from 1420. By public transport catch a bus from Plymouth. 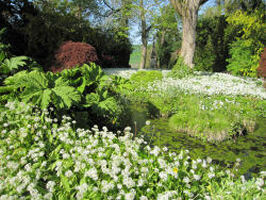 Mount Edgcumbe - Tel: 01752 822236 - attractive 900 acre gardens are open all year and free. Dating back to Elizabethan times, they contain a deer park, follies, parkland, Italian gardens and an orangery. Mount Edgcumbe House, open to the public for a fee on certain days, is a reconstruction of a 16th century building destroyed in the Blitz. Mount Edgcumbe is host to the National Camelia Collection. The mild Cornish climate and Mount Edgcumbe's stunning location surrounded on three sides by water at the entrance to Plymouth Sound ensures that these beautiful and diverse shrubs are at their best from early February. By public transport - catch the train to Plymouth, then walk to Stonehouse and catch the wonderful Cremyll ferry over the Tamar. East and West Looe face each other across the combined estuary of two rivers and are joined by a broad seven arched bridge and by a small passenger ferry closer to the sea. It was formerly a pilchard fishing community and fishing is still a major industry. However, the arrival of the railway in 1859 brought the first wave of summer visitors and tourism is now the towns mainstay. 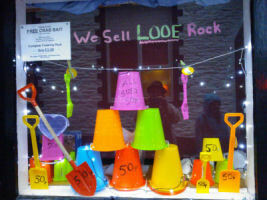 There is plenty of character left though, with a labyrinth of narrow streets and courtyards in the old quarter of East Looe sandwiched between the still active fish quay on one side and the sea front with its small beach. 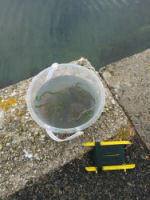 Fishing and pleasure boat trips can be booked at the fish quay. There is a plethora of places to eat in Looe, many of them specialising in locally caught fish. 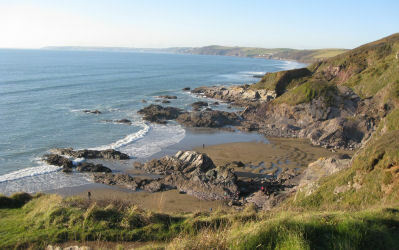 A popular coastal walk is from West Looe to Polperro. Polperro is an old fishing village, now largely dependant on tourism but still attractive never the less. There is a return bus service which leaves from the Crumplehorn pub in Polperro for Looe. Plymouth is only 15 minutes away by train along what must be one of the most beautiful stretches of line in the country, culminating with crossing the Tamar on Brunel’s famous Royal Albert Bridge. 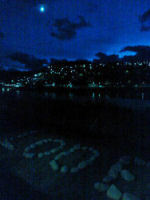 The sea has played a prominant role in the city’s history. Its position at the mouth of the Tamar estuary affording it deep, sheltered waters. The naval dockyard of Devonport was established here and is still a major employer. The city center has been largely pedestrianised and has all the major names as well as smaller specialist shops. 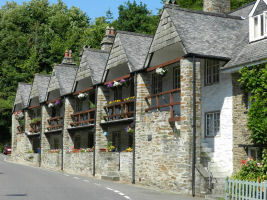 The Barbican area is an old fish quay with narrow cobbled streets, boutique antique and arts shop, cafes and restaurants. It also is the centre for Plymouth night life in the evenings. Plymouth Arts Centre - Thriving arts hub with film, cafe and modern art displays. Mayflower Steps - where the Pilgrim Fathers left for America. Elizabethan House - as it would have been in the time of Elizabeth I inside and out. National Marine Aquarium - Tel: 01752 600 301 - recreates different marine enviroments and includes 15m x 5m glass wall. The Hoe - where Francis Drake had his famous game of bowls. Either follow the sea wall around from the Barbican, or cut through the city centre. Two miles from the station is The Royal William Yard, PL1 3RP, a former military barracks now teeming with high quality restaurants and art galleries. A highlight is the monthly Farmers Market (March-December) on the first Sunday of the month. Further out of Plymouth is Saltram House (National Trust) - Tel: 01752 333500 - former stately home to the east of Plymouth. 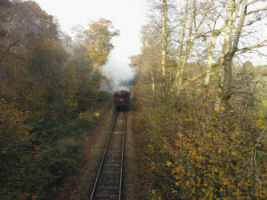 Also of interest is the small but friendly Plym Valley Railway in Plympton, PL7 4NW. This is the start of the Plym Valley Trail, an off road cycle path going all the way to Tavistock across the moors. 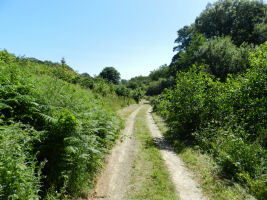 Incorporating the Plym Valley Trail, the Drake’s Trails are a series of off road cycle paths around Plymouth. 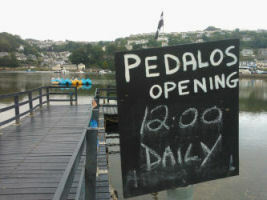 In summer bikes can be hired from Plymouth Bike Hire 07577 279928, at the start of the Plym Valley Trail. 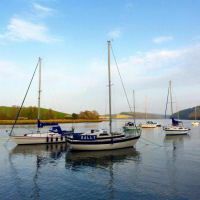 Plymouth Boat Trips offer trips up the Tamar to Calstock, Morwellham and up the river Yealm. 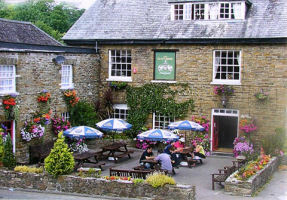 Much smaller than Dartmoor but just as capable of instilling a feeling of isolation, there are many fine walks and it is easy to drop down into one of the surrounding village pubs for refreshment. Caradon Mining District is part of the Cornish Mining World Heritage area was worked extensively for tin, copper and silver, so there are some amazingly well preserved heritage ruins. Sterts Theatre - 01579 362382.Enclosed open air theatre (with large canopied cover), with cafe and arts centre. Hold a variety of interesting events throughout the year. Minions Visitor Center - cunningly disguised inside an old mine engine house, summarises the moors history. The centre is currently closed due to a problem with the roof. At 365 square miles, this is a vast area of granite tors, bog, heather and gorse offering fine walking and views. Burrator - reservoir with a high granite dam and an easy perimeter walk. Brent Tor - isolated conical tor with a small church dedicated to St Michael on top. Magnificent views. 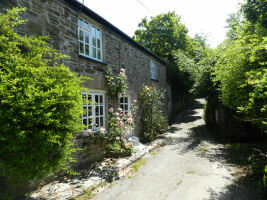 The Garden House - Tel: 01822 854769 - gardens in the Lovecombe Valley on the SW slopes of Dartmoor.